Kraków’s Wawel Hill is the ancient nucleus of the city itself. Perched neatly on a limestone bluff on the banks of the meandering Vistula River, this naturally defensible position has been the centre of human activity since the first ever settlements appeared in Kraków as early as the 4th century AD. On its top sits Kraków’s answer to the Roman Colosseum, the grandiose and magnificent 14th century Wawel Castle, an imposing and symbolic image of the city’s medieval might and superlative architecture. In the same vein of most all of Kraków’s iconic sites, the Wawel is shrouded in a mythic history characteristic of its medieval beginnings. Legends dating from the 7th century tell of a formidable Dragon, the Smok Wawelski, who terrorised the surrounding farmlands. The eponymous hero of the tale is the Slavic King Krakus, who is said to have enlisted the help of a clever local cobbler named Skuba, who defeated the dragon with a Trojan horse trick involving a sheep stuffed with sulphur. After devouring the poisoned sheep, the Smok Wawelski attempted to quench his thirst from the river, but was unable to stop drinking and finally died from gross over hydration. Today, visitors can take a walk down the aptly named Ulica Smocza (Dragon Street), that runs parallel to the Wawel Hill, towards the cast metal sculpture of the Wawel Dragon that breaths fire at the intrepid onlookers. It’s situated near to the Smocza Jama, the Wawel’s most famous cave and supposed legendary lair of the Smok Wawelski himself. Atop the Wawel Hill, Kraków’s medieval castle and palace complex dominates the city’s skyline on all sides. Elevated at a height of 230 metres above sea level, it looms dominatingly over the Old Town and Kazimierz districts that it separates. The complex contains a myriad of royal, religious and fortified buildings that date from various periods of constructions, beginning in the 11th century. The most notable (and formative) are perhaps the 15th century extensions made during the reign of King Jadwiga (1384-1399). These include a series of residential tower wings, the so called Danish Towers that jut out from the main body of the fortified castle walls, and the appropriately named Jadwiga Chamber that now houses Poland’s coronation sword, a national artefact. Also of note are the 14th century gothic palace complexes built during the reign of King Casimir III. These form the boundaries of the Wawel’s curiously irregular central courtyard, and define the central structure of the castle as a whole. The construction projects during this period were particularly formative and of great importance to Poland’s development as a nation. 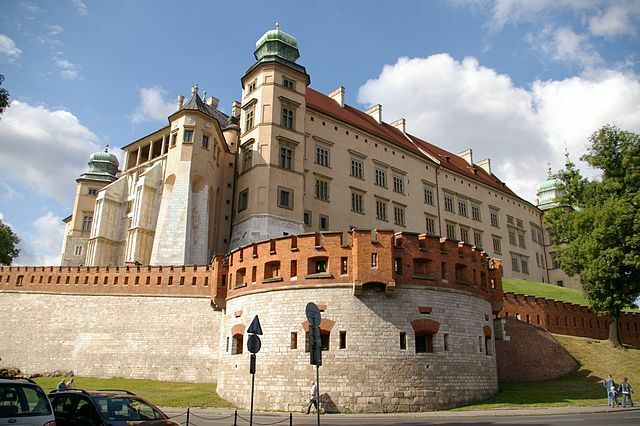 For almost six hundred years the Wawel castle was the official residence of the Polish Monarchy, and Kraków was the capital, until this was transferred to Warsaw in the late 16th century. In the early stages of the European Renaissance, the Wawel underwent sweeping architectural changes that saw many of its secular buildings reconstructed in the style of Italian and Neoclassical themes. The best example of this is perhaps the façade of the residence buildings that was completed in 1536 by Sigismund I in the style of the Florentine palatial frontispieces. After Warsaw became Poland’s capital, the national focus shifted away from the Wawel Hill, and extensions stopped altogether. What’s more, during the Second World War, the Castle complex was used as the official residence for the German governor, and many of the historical and artistic riches were transported safely from the site. Today, however, the Wawel castle, with most of its artefacts restored in the post-war period, is an enduring symbol of Kraków’s historical power and preeminent beauty.